The MG Metro was introduced in October 1982 some 6 months after the launch of the MG Metro 1300 and 2 years after the pain of closure of the MG factory at Abingdon. This tainted many MG enthusiasts reception for this car in a negative way as it was somewhat different to the traditional sports car market, although at this time the then new ‘hot hatch’ era heralded by the Golf GTi was in full swing, and as far as manufacturers and most car buyers were concerned open top two seat sports cars were something from the past. Indeed the modest sales expectations for the MG version of the Metro range was expected to be no more than 10%, yet in a short period of time sales were running in excess of 25%. Mainstream MG enthusiast view though remained tainted and the model was unfairly tarred with the ‘badge engineering’ label that was rightly created to describe the BMC saloon ranges of the 1960’s. 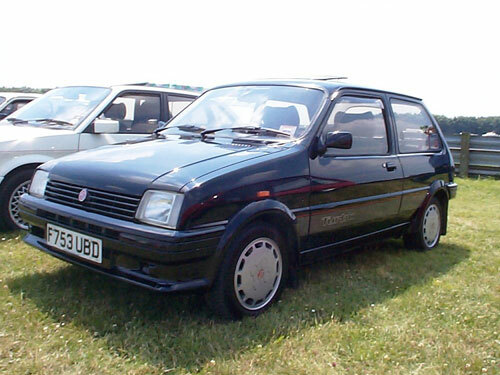 The reality was that the development and re-engineering that the car was given to the MG Metro 1300 was significant and it was a model in its own right, with performance and handling to easily beat the recently demised MGB, but the Turbo was a completely different model with a huge raft of changes not seen in any other Metro. However, even with all these changes it didn’t change the body shape and it remained a three door Metro in profile, which for the entrenched enthusiast was still not enough compensation for the demise of the two seat open top sports MG.
Had the MG Metro been supported by a continuing MGB, with the planned and developed O series engine, it is clear that the perception of this model and the follow on MG Maestro and Montego models would have been considerably different. It is debatable whether this would have impacted much on the sales of the car, but as enthusiasts are responsible for the survival of many cars over the very long term it is obvious that a better accepted car would have meant many more would be around today. Back to reality though and history shows that the build quality of the cars was quite variable, unfortunately this went from very bad to only acceptable in the first few years and really only after around 1986 were there more consistent and better results. The spec and performance of the cars was generally very good and more than competitive for the day, although even then the limitations of the A series engine mounted on top of the only four speed gearbox (Mini powertrain remember) was seen as a disadvantage to the then common end on 5 speed gearboxes that most competitors had. Indeed this turbo version was more restricted with just four speeds than the less powered MG Metro. The MG Metro Turbo was a leader for its day with the Lotus Engineering assisted design for the very comprehensive changes that were done to the engine which was very capable of handling the modest 93 bhp the standard engine was quoted at, although many actually delivered closer to 100 in standard unmodified form. Later tuned race cars would push that power to 200bhp, a massive power level for that period and even more so for a 1300cc engine! Other positive features included powerful servo assisted brakes using four pot (piston) calipers and ventilated discs up front. The Turbo also came with a bodykit that provided a front spoiler and four wheel spats to go with the MG Metro rear spoiler and this together with the use of Turbo only specific larger 13” alloy wheels and low profile tyres the individual look was enhanced considerably. The engine was fitted with a Garrett T3 turbo on a specially designed and cast exhaust manifold. Compressed air was delivered to the single carburettor that was specially modified to run with pressurised air by having special sealing and a variable rate fuel pressure delivery to ensure a constant positive 4psi fuel delivery pressure whatever the operating pressure was. The engine was also significantly strengthened with materials and processes common to competition engines with many Turbo only parts such as the cylinder head, pistons crankshaft, block, sodium filled exhaust valves, etc. This was a pretty unique engine yet when fitted into the car it didn’t look that different. The Achilles heel for the Turbo was the 4 speed gearbox as the engine was in simple terms too powerful for it. To try and compensate for the weakness Austin rover developed a two stage electronic control for boost to try and soften the impact. The problem was that peak torque with even low levels of boost would damage the gearbox so boost was set on the wastegate at a low 4 psi. However, at 4000rpm or higher an electronic module would allow a controlled leak from the sensor hose going to the wastegate and would allow air to ‘leak’, so that the wastegate actuator would see a lower pressure and would not lift the wastegate valve off its seat. That allowed the boost pressure to rise and only when it reached 7psi would the module then close off the ‘leak’ and allow the wastegate to move. It would then modulate the leak to maintain this raised boost pressure until rpms dropped below 4000rpm. This quite complex boost control was a forerunner of almost all current turbo equipped engines of today, but it couldn’t fully help overcome the inherent gearbox weakness and so broken gearboxes were not uncommon. Specialist uprated gearbox parts can significantly improve the torque capacity of a Turbo gearbox, plus there are also five speed conversions, so for the cars that have not been broken for their engines to be put in Minis, there is scope for much improvement, but at a cost! One area these cars patently failed to deliver was in their longevity as they rust with the speed that ice melts in summer sun! Allied to the iffy build quality, the poor reception and very low residual values it is hardly surprising that apart from at Classic Car shows the MG Metro Turbo is a very rare sight. During the cars production life it was subject to a facelift in October 1984 when the bonnet line was lowered and streamlined and a new interior and dash moulding was introduced. This was a common facelift across the whole Metro range but the MG models retained the stand alone features that allowed it to stand apart from the mainstream Austin and Vanden Plas models. In following years there was some streamlining and cost saving across the whole Metro range with perhaps the most obvious being the change of style for the alloy wheels from a rather flat front design to a cross spoke design that was well received. In addition the original 165/60x13 spindly tyres changed to a meatier 185/55x 13 sizes that enhanced look as well as grip. What was seen as a very negative move was in the 1989 model year changes where external styling saw the introduction of large split Octagons and the MG logo down the sides of the cars. This aside the cars were generally quite well screwed together. The MG Metro Turbo was replaced in 1990 by the Rover Metro GTi, with the advanced K series engine delivering more power and delivering it through an end on 5 speed gearbox. Now though the Rover management had decided the MG badge was for genuine sports cars only and already plans and actions were afoot to provide such cars. Thus the performance Rover Metros were to be the GTa and GTi models. Front: Independent bottom link braced by anti roll bar. Top link operating Hydragas spring. Telescopic dampers. Rear: Independent trailing arms, anti roll bar, coil spring pre loaded on Hydragas unit. Tyres: Steel braced radial low profile 165/60 VR13. Brakes: Front - 4 piston calliper ventilated disc. Rear-7" drum.